comondoo! is the smart navigation system for processes of any kind. The employees involved in a process are accompanied from A to Z, the process manager is enabled to always keep the overview. It's about business, it's about productivity, it's about efficiency - and most of all it's about the most valuable asset within your processes: it's about people. You don't want to document, redraw and explain your processes over and over again, you want to have your people working efficiently. Realize now what you always aimed for! Start to drastically increase your team’s productivity, to cut down paperwork, and to complete processes faster - start to provide your people with the tasks, the information, and the required tools when they need it, where they need it. This is what it is about: get your processes implemented, followed, and improved. Immediately. With your people. With comondoo. We can highly recommend the product comondoo!, especially as the handling of the tool itself has been designed extremely user-friendly. New employees can become acquainted with existing processes without any additional training, as comondoo! guides them through the individual process tasks. M. Allemann, Devision Manager Services JSD, Basel. what needs to be done, informed and efficiently. And nothing else. With comondoo! even the most complex process is ultimately transformed into a type of dynamic checklist. Easy to follow and straightforward. 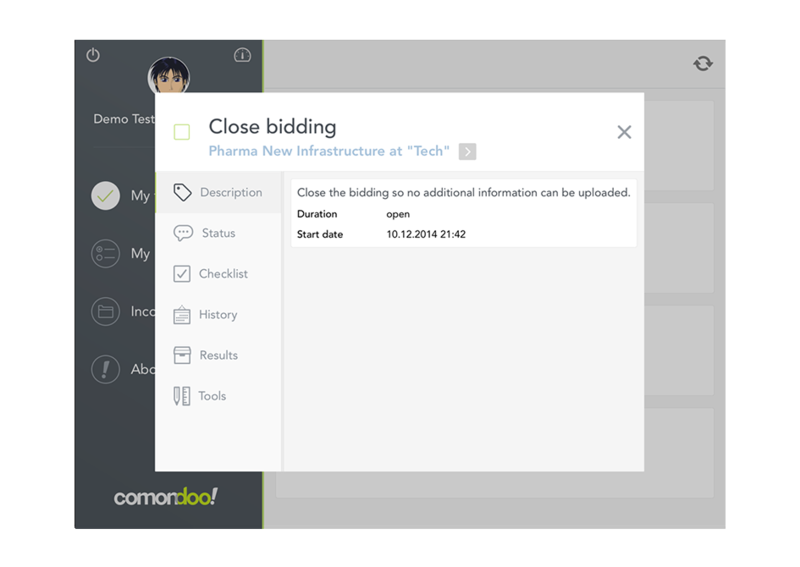 Whether complex process documentation, BPM model, Excel document, or a quick sketch on a notepad: existing process structures can easily be imported into comondoo! in the form of a linear checklist. Or create your process directly in the system with just a few clicks. Assign responsibilities in a simple and structured way. Once a process is saved in the system, tasks are organized and assigned according to a responsibility matrix. Each listed process action is then assigned to the relevant staff member, along with any external resources. After a final check for coherency the process is ready to be executed. A staff that knows the way. That's what you can count on. A saved process can be started in no time at all. As your process assistant, comondoo! takes care of all the rest and automatically informs all participants by e-mail that the process has been initiated. Provide participants with individually relevant information and instructions while effortlessly documenting all actions taken during the process. During the process, comondoo! provides participants with individually relevant information and instructions at the proper time. comondoo! automatically documents all actions taken by participants. Process progression can be seen in the monitoring area at any time, and can be followed seamlessly through an audit log, even in retrospect. Here the user has an actual overview of all the current open tasks. Here the user has full overview of a specific task, including description, checklist and access to required templates or systems. Here the user has an overview of all the current open tasks. Here the user gets the overview of all running processes and their current statuses. Drill down to task level and get any required information. The user has - at any time - access to all completed processes which the user has been part of. Drill down to task level and get any required information. The user has - at any time - access to all uploaded process documents. This for ongoing as well as completed processes. 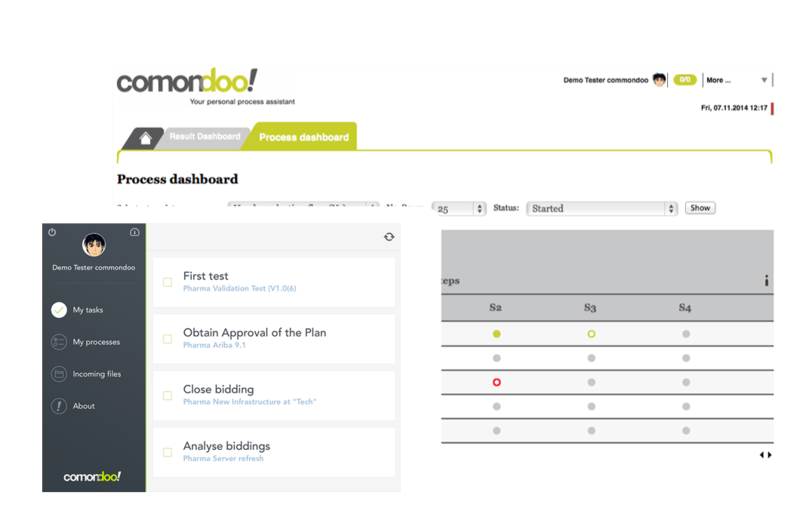 Delve deeper to predict your clients’ objections and empower follow-up.Comondoo has developed a range of KPI values enabling the user to optimize processes instantly. 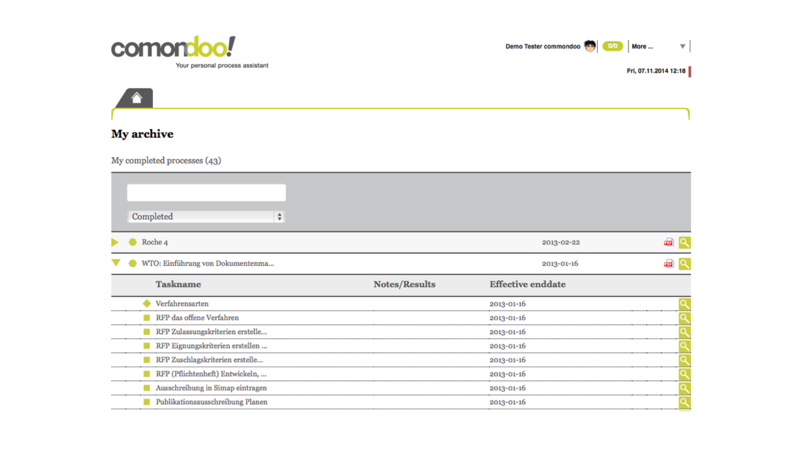 The user can simulate any process to find the expected completion date. comondoo! connect you and your staff, creating simple and active collaboration. Everyone benefits. 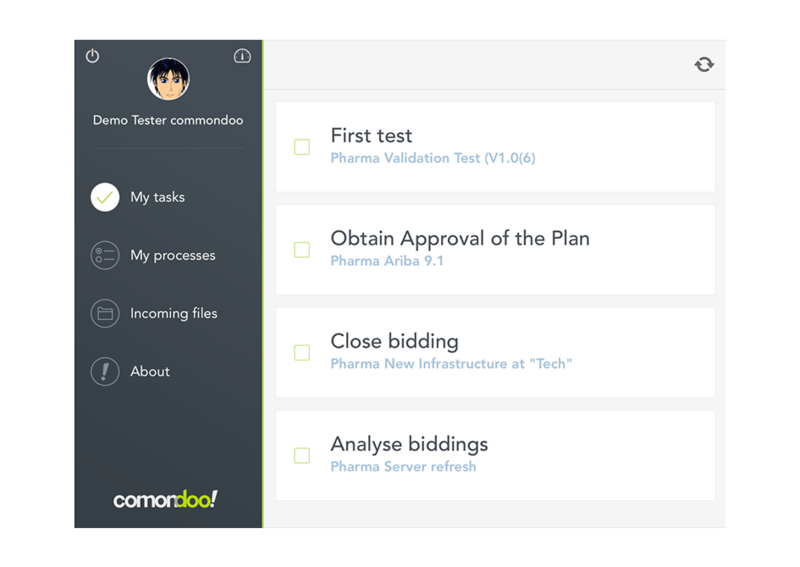 Staff are actively and directly supported by comondoo! in carrying out their work. New staff members more easily integrated into company workflows. The time required to incorporate new or rarely used processes or highly complex process steps is greatly reduced. Informed and efficient work increases motivation. comondoo! coordinates the flow of work and information. The use of social media elements enables collaboration between your staff members that is easier and more interactive. Using comondoo! is surprisingly simple and requires no significant training. 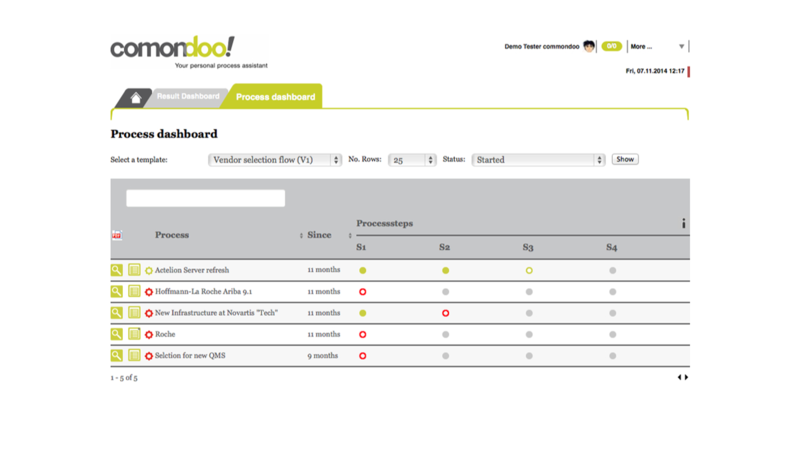 Active processes can be monitored and controlled easily and in real time using the comondoo! studio. This allows for prompt and proactive actions during the course of the process. The browser-based comondoo! assistant offers an overview of upcoming tasks and necessary information, anytime. This allows for work to be more informed and focused on what’s essential: the task. Process owners gain a better overview and more control over workflows in increasingly dynamic business structures. Complex processes become more manageable and easier to follow as a dynamic checklist. comondoo! lets you be flexible. comondoo! 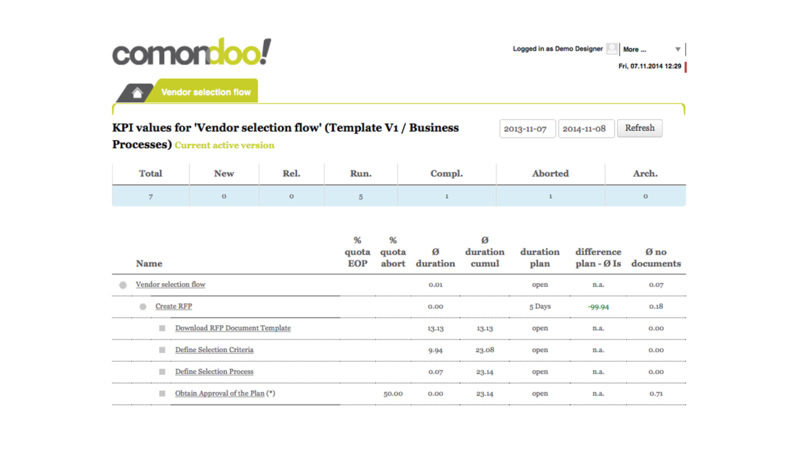 quickly and easily allows company workflows to be optimized or adapted to changing situations. New structures are easy to implement. comondoo! is intuitive and easy to use. There is no software to download or install. Just open comondoo! in your browser or download the app, log in and start! It’s just as easy as online banking or web-based e-mail services. The cloud is still evolving and the latest innovations from comondoo are now making business processes even more mobile and collaborative. Here's why you will love comondoo! No more printing, scanning, or snail mail. Upload a document and the process will take care of the rest. Keep track of what the team is doing: collaborate, comment, leave feedback on the Wall or just leave a post-it. Running business online makes it faster, smarter, safer, and organized. Send your processes on the go. Make your entire business process lifecycle mobile. Learn about a simple tool that easily optimizes and structures processes in your company! If you like to know more about comondoo!, we'd be happy to give you a more detailed introduction. Get in touch! Get a feeling how comondoo! works. Get started and in no time you will be guided through a process. Alle unter der Internet-Adresse www.comondoo.com auf dem Netz publizierten Informationen und Inhalte sind urheberrechtlich geschützt und stehen unter dem Copyright der Petersen Consulting Services GmbH, nachfolgend comondoo.com genannt. comondoo.com behält sich ausdrücklich alle diesbezüglichen Rechte vor. Durch Nutzung, Herunterladen oder Kopieren werden Ihnen keinerlei Rechte im Hinblick auf die Software oder andere Elemente der unter der Internet-Adresse www.comondoo.com abrufbaren Inhalte übertragen. Die Benutzer von comondoo.com verpflichten sich ausdrücklich, die auf comondoo.com zugänglich gemachten Informationen in keiner Weise oder Form ausserhalb des ursprünglichen Verwendungszweckes weiter zu verwenden. Insbesondere unterlässt es der Benutzer, die zugänglichen Daten zu kopieren, zu veröffentlichen oder sonstwie, namentlich auf dem Internet, in irgendeiner Form wiederzugeben. Links auf die Angebote von comondoo.com sind ausdrücklich gestattet, vorausgesetzt, dass diese als Angebote von comondoo.com klar erkennbar bleiben. Bitte informieren Sie comondoo.com, wenn Sie einen Link auf das Angebot von comondoo.com anbringen, damit comondoo.com Sie bei einer allfälligen Umstrukturierung Ihrer Site entsprechend benachrichtigen kann (info@comondoo.com). Bei Verstössen gegen diese Copyright-Bedingungen behält sich Petersen Consulting Services GmbH ausdrücklich vor, rechtliche Schritte einzuleiten. comondoo.com ist bemüht, die Genauigkeit und Aktualität der von ihr präsentierten Informationen sicherzustellen, doch macht sie weder eine explizite noch implizite Zusicherung oder Gewährleistung hinsichtlich deren Richtigkeit, Zuverlässigkeit, Aktualität oder Vollständigkeit. comondoo.com behält sich ausdrücklich das Recht vor, die von ihr publizierten Informationen jederzeit zu ändern oder dem Zugriff der Öffentlichkeit zu entziehen. comondoo.com haftet in keinem Fall (einschliesslich Fahrlässigkeit) für Verluste oder Schäden, inklusive direkter und indirekter Folgeschäden, die sich aus dem Zugriff, der Benutzung oder jeglicher weiterer Verwendung der von ihr publizierten Informationen und Ansichten oder aus der Verlinkung von comondoo.com mit anderen Websites ergeben könnten, auch wenn comondoo.com auf die Möglichkeit solcher Schäden hingewiesen worden ist. Von der Website www.comondoo.com aus sind andere Websites über von comondoo.com eingefügte Links zu erreichen. comondoo.com kann für diese Websites und deren Inhalte keinerlei Gewähr und/oder Haftung übernehmen.